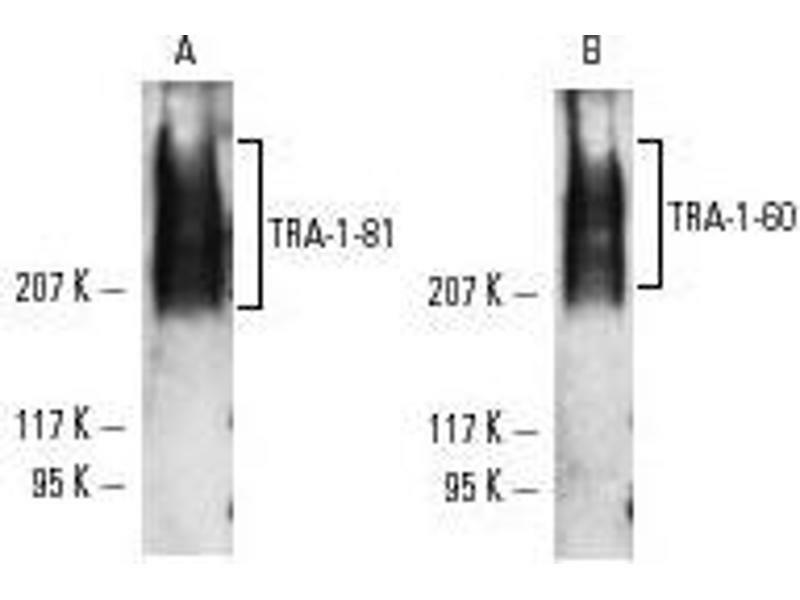 Western Blot: TRA-1-81 Antibody (TRA-1-81) [ABIN151343] - Western blot analysis of ABIN151343 expression in NTERA-2 cl.D1 whole cell lysate. 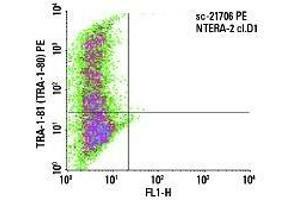 Flow Cytometry: TRA-1-81 Antibody (TRA-1-81) [ABIN151343] - Indirect FCM analysis of NTERA-2 cl.D1 cells stained with ABIN151343, followed by PE-conjugated goat anti-mouse IgM. 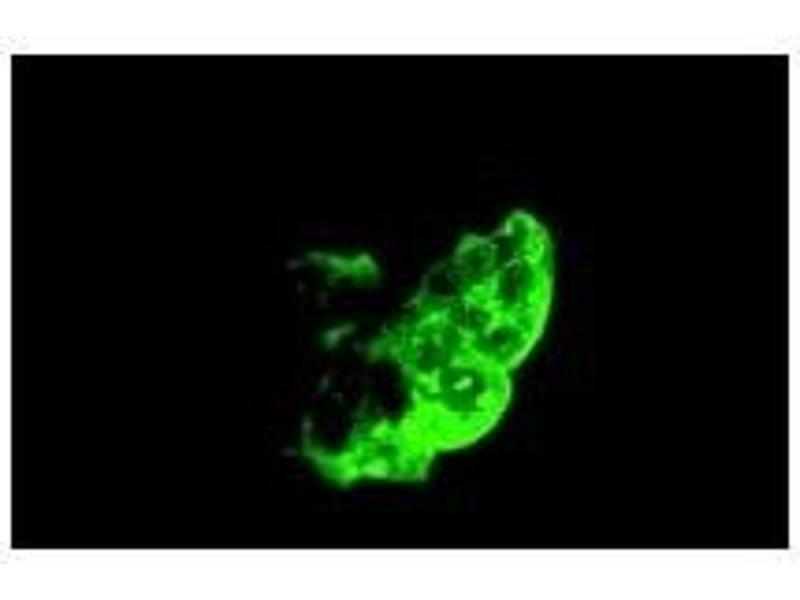 Immunofluorescence: TRA-1-81 Antibody (TRA-1-81) [ABIN151343] - Immunofluorescence staining of methanol-fixed NTERA-2 cl.D1 cells showing membrane localization. 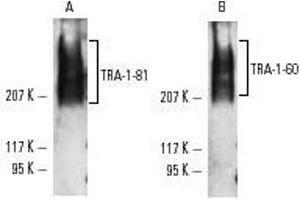 Flow Cytometry: TRA-1-81 Antibody (TRA-1-81) [ABIN151343] - Analysis using the Alexa Fluor (R) 488 conjugate of ABIN151343. 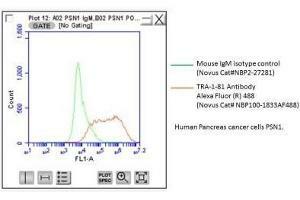 Staining of human cancer line PSN1. Image from verified customer review. 免疫原 Human embryonal carcinoma cell line 2102Ep. 应用备注 Western Blot 1:500, Flow Cytometry 1:10-1:1000, Immunohistochemistry 1:50-1:200, Immunocytochemistry/Immunofluorescence 1:50-1:200, Immunoprecipitation 1:10-1:500, Immunohistochemistry-Paraffin 1:50-1:200, Immunohistochemistry-Frozen 1:50-1:200This TRA-1-81 antibody is useful for Immunofluorescence/Immunocytochemistry, Immunohistochemistry-Frozen, Immunohistochemistry-Paraffin, Immunoprecipitation and Western Blot. 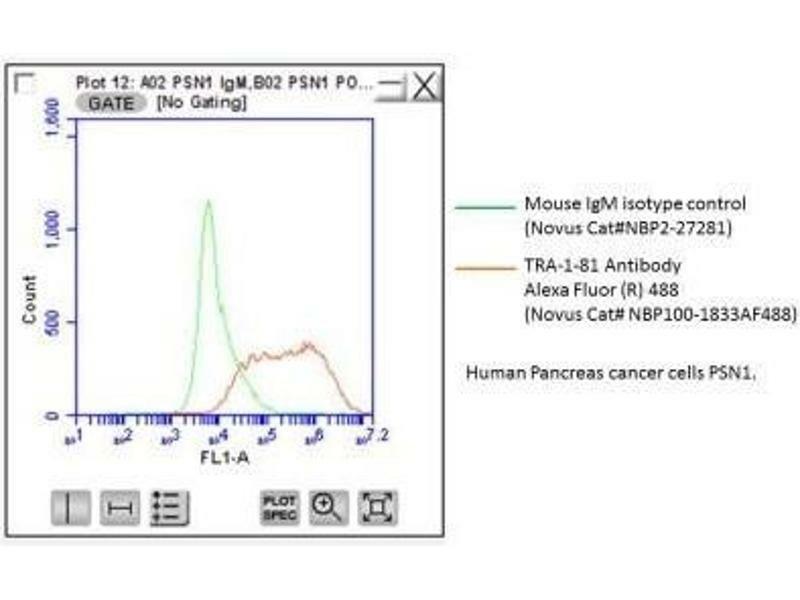 Flow Cytometry was reported in scientific literature. 实验流程 Protocol Specific for NB100-1833 Immunocytochemistry ProtocolCulture cells to appropriate density in 35 mm culture dishes or 6-well plates. 1. Remove culture medium and add 10 % formalin to the dish. Fix at room temperature for 30 minutes.
. Remove the formalin and add ice cold methanol. Incubate for 5-10 minutes.
. Remove methanol and add washing solution (i.e. PBS). Be sure to not let the specimen dry out. Wash three times for 10 minutes.
. To block nonspecific antibody binding incubate in 10 % normal goat serum from 1 hour to overnight at room temperature.
. Add primary antibody at appropriate dilution and incubate at room temperature from 2 hours to overnight at room temperature.
. Remove primary antibody and replace with washing solution. Wash three times for 10 minutes.
. Add secondary antibody at appropriate dilution. Incubate for 1 hour at room temperature.
. Remove antibody and replace with wash solution, then wash for 10 minutes. Add Hoechst 33258 to wash solution at 1:25,0000 and incubate for 10 minutes. Wash a third time for 10 minutes.
. Cells can be viewed directly after washing. The plates can also be stored in PBS containing Azide covered in Parafilm (TM). Cells can also be cover-slipped using Fluoromount, with appropriate sealing. *The above information is only intended as a guide. The researcher should determine what protocol best meets their needs. Please follow safe laboratory procedures. Rossbach, Hildebrand, El-Ahmad, Stachelscheid, Reinke, Kurtz: "Corrigendum to "Generation of a human induced pluripotent stem cell line from urinary cells of a healthy donor using an integration free vector" [Stem Cell Res. 16/2 (2016) 314-317]." in: Stem cell research, Vol. 17, Issue 2, pp. 461, 1970 (PubMed). 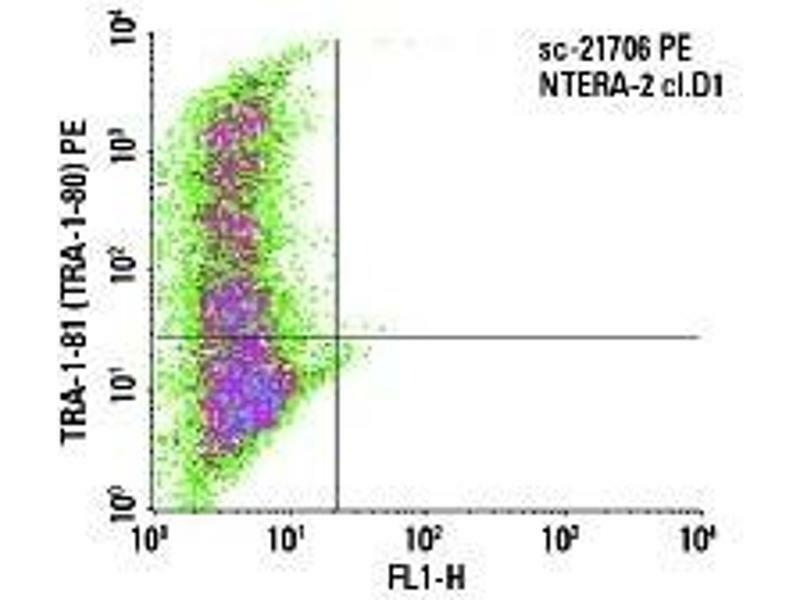 Method employed by authors: Immunofluorescence (fixed cells) (IF/ICC) (Sample species: Human). Rossbach, Hildebrand, El-Ahmad, Stachelscheid, Reinke, Kurtz: "Generation of a human induced pluripotent stem cell line from urinary cells of a healthy donor using integration free Sendai virus technology." in: Stem cell research, Vol. 21, pp. 167-170, 1970 (PubMed). 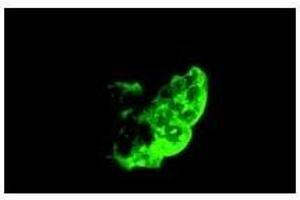 Method employed by authors: Immunofluorescence (fixed cells) (IF/ICC) (Sample species: Human).